This Grown-Up Tuna Melts recipe – with banana peppers, sourdough bread, provolone cheese, tomatoes and more – is my retro recipe makeover of the simple Tuna Melts that my Dad used to make us when I was a kid. I haven’t made tuna melts in years. Over 10 years, would be my best guess. But my son remembers them and he loved them. They weren’t fancy. It was the cheapest tuna, mixed with mayonnaise and pickle relish, spooned onto plain white bread, and topped with an American cheese slice. I baked them in the oven on a baking sheet until the cheese melted. The same way my Dad made them when I was a kid. Sunday Supper this week was all about “Retro Recipes”. And that’s when I decided to finally give into my son. But rather than going completely old school with them, I decided to try something new — I made what I call Grown-Up Tuna Melts. 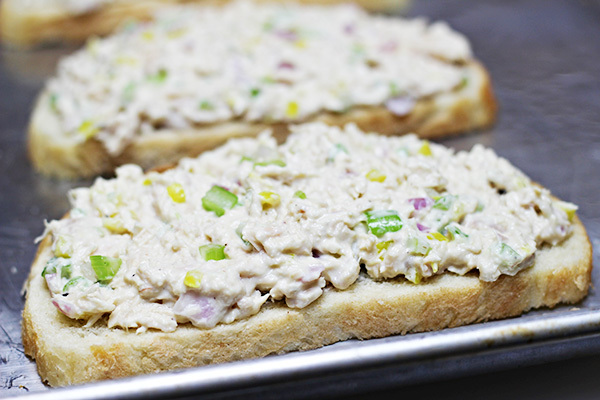 My Grown-Up Tuna Melts are made with solid white albacore tuna, chopped red onion, chopped celery and chopped banana peppers. The bowl I used was one of the silver metal bowls that my Dad used to always make tuna salad in when I was younger. Seeing this bowl always reminds me him making his tuna sandwiches, so using it in my kitchen for tuna is my little tribute to him. I also mixed in mayonnaise and lemon juice, plus seasoned it with freshly ground salt and pepper. Rather than plain white bread, I used a San Francisco style sourdough bread. The mixture was divided among 4 slices of sourdough, which were placed on a baking sheet. I added 2 tomato slices to each tuna melt and then 2 slices of provolone cheese to each. The Tuna Melts are baked in oven until hot, melted and starting to brown. When I pulled them out of the oven, I was happy. They looked so good and after I tasted them, I decided that the changes I made not only had me enjoying these tuna melts, but had me happy enough with them to put them on the menu more often. Preheat oven to 425 degrees F. Spray a baking sheet with cooking spray. In a medium bowl, combine tuna, mayonnaise, onion, celery, banana peppers and lemon juice. Season with salt and pepper, to taste. Lay bread on baking sheet. Spoon and divide tuna mixture on the bread slices. Top each tuna melt with two slices of tomatoes and then 2 slices of provolone cheese. Bake in oven for 15-20 minutes, or until cheese is hot, bubbly, and starting to brown. Serve immediately. –You may wish to use more, or less, mayonnaise. I have actually found 1/3 cup + 2 tablespoons to be the amount our family likes best. Want more recipes using canned tuna? I recommend the “200 Best Canned Fish and Seafood Recipes: For Tuna, Salmon, Shrimp, Crab, Clams, Oysters, Lobster and More” cookbook by Susan Sampson. It has 200 ways to transform the canned tuna and various seafoods into delicious dishes. I shared my retro recipe re-do, and there is lots of other food bloggers participating in Sunday Supper who are also sharing retro makeovers OR some are sharing the original retro recipe. Either way, you’ll find lots of blasts from the pasts in this list below — check them out and tell them I sent ya! This looks so good – I love a toasty tuna melt! Thanks for sharing this at Turn It Up Tuesday! 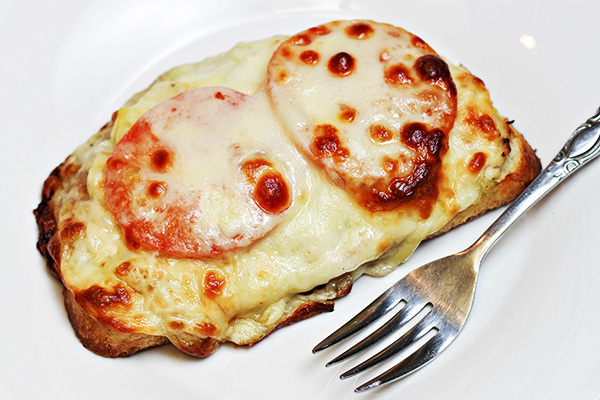 These look delicious, and I love that you made them open faced. Great dinner idea! 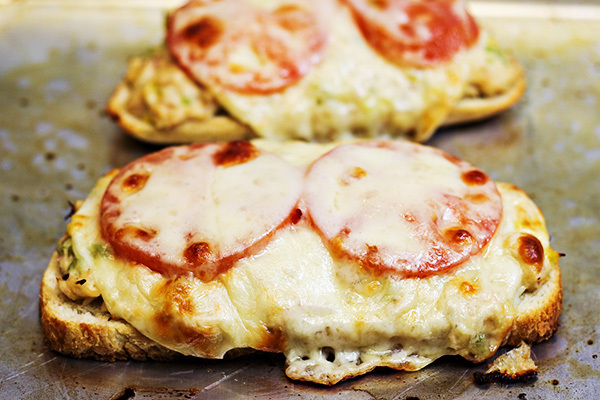 These tuna melts would be just perfect for breakdast! I’ve never eaten a tuna melt, mostly because it scares me! Your dish looks really delicious however – I might be willing to give it a shot. Tuna melts remind of a great NYC diner…any of them! I like the addition of the red onion and banana peppers. Damn…now I want one!! 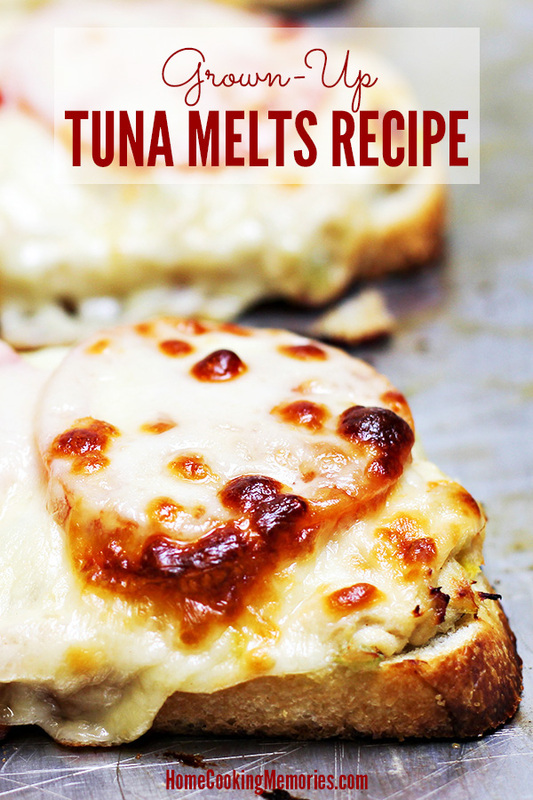 I’ve never had a tuna melt but this recipe is making me want to try one soon! I love how you made it into a grown-up version. Sounds delicious with all the new additions you added! These look so melty and toasty! Warm tun isn’t my favorite, but I certainly wouldn’t turn these down! YUM! love tuna melts thanks for sharing. The first tuna melt I ever had was at the restaurant around the corner from where I worked way back in the 80’s. Since then I’ve always loved tuna melts. And I have a confession…I’ve never made them. That means I haven’t had one in forever. I need to make this retro dish for the first time. I’m loving your recipe with the banana peppers in the mix. Yum! I love that you jazzed up a boring tuna melt. This is fancy schmancy! I may have to lift my pinkey while eating it. But I am making this dish for sure! You reminded me that I haven’t had tuna melt in forever! Maybe not quite 10 years though 😉 I’m also a creature of habit and make the same dishes over and over again. When I find something I love eating, I eat it until I abuse the recipe. I had to stop eating greek yogurt because I ate it for a year straight with my lunch (not kidding either! At least they had a variety of flavors). Anyway, thanks for reminding me that tuna melts do exist and that I’ll be buying bread, cheese, and tuna soon. I love this post! I think we all have childhood meals that our parents threw together because they were quick, easy and cheap. Sometimes they still taste amazing now and bring back all those nostalgic feelings, and sometimes you wonder “how in the heck did I love this as a kid?” Your grown up, gourmet version of the tuna melt looks phenomenal! I love all the changes you made and would happily eat this. Seems like it tastes good and I really love the awesome look of this dish, I really love to try this. Thanks a lot for sharing! Lovely twist on the classic. Great addition with the tomato. 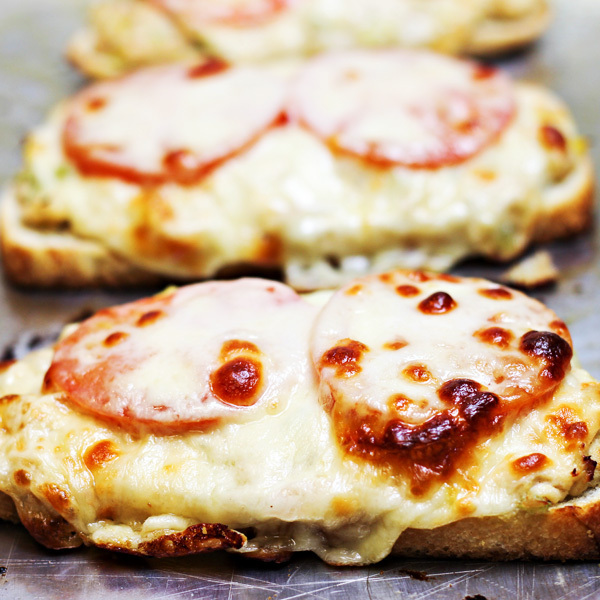 I can imagine how delicious it is when the cheese melt in our mouth…..yum! Great choice of bread too! 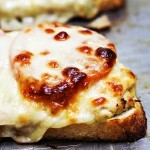 That blistered cheese is calling my name! Great way to eat your tuna! In a word: YUM! Your blog, with classic recipes, is so appropriate for this #SundaySupper challenge. Thanks for sharing. I love tuna but never had a tuna melt. Might have to make these with a lot of red onion. I’ve never had a tuna melt I liked. This one looks pretty darn good. I am still one to make a tuna melt on a night when I am too busy to really cook. Your grown up version looks delicious-I’ll have to remember the recipe the next time I’m making these! What a great twist and grown up version of an old classic! 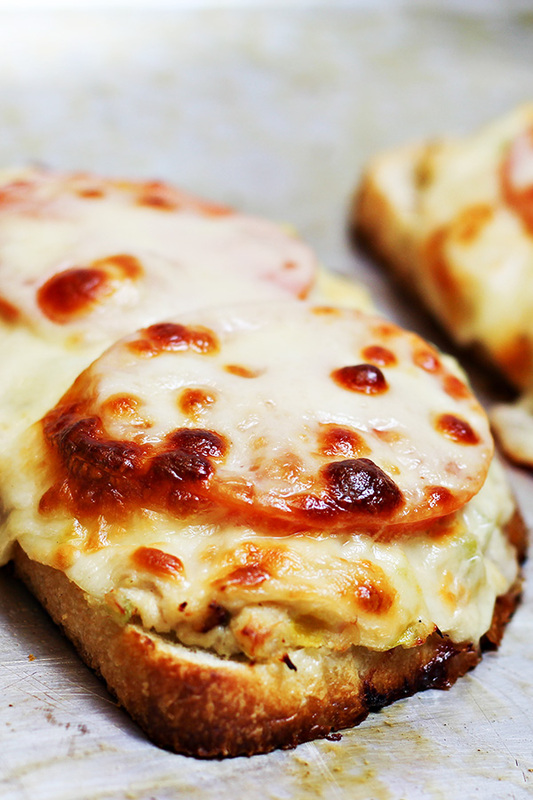 I have never in my life had a tuna melt – these look SO good! I’ve never had a tuna melt sandwich. Can you believe it? I love cold tuna sandwiches but never fancied warm tuna but your version is making me hungry! I will have to try the next time I make tuna. I haven’t had a tuna melt in a while, but I do love them–when I was in high school, I’d make tuna melts as snacks for me and my friends! Think this may need to be lunch today! This makes me hungry for a tuna melt. Mmm, cheesy. I love tuna melts. These look amazing. These came out awesome Brandie! 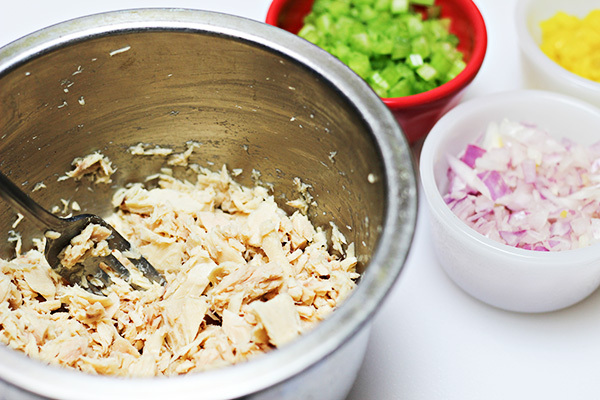 Love the additions in the tuna salad and the memories of mixing it in the bowl your Dad used! I LOVE this!!!! And I love that you added tomato..I totally grew up on this! I have to be honest: the phrase “tuna melt” doesn’t always bring forth images and memories of deliciousness, but your version?!?! They have me drooling. They look so bubbly, golden, and perfect. I might just be a believer now. Want! Melty cheese…. yum yum yum! I’m plain drooling over these! Pinned! I would definitely enjoy that tuna melt. Great recipe! Those look fabulous! I love the bread and the additions. I have never tried banana peppers in tuna but I will now.